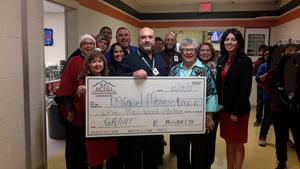 Congratulations to Mr. Miguel Moreno, parent liaison, for receiving a $1000 check from the MCISD Education Foundation! Mr. Moreno applied by writing an essay on how he would spend the money on our students, parents, and our school. During his first year at our campus, Mr. Moreno has increased parental involvement, conducted parent classes, and helped our students and community. Thank you for the awesome job you are doing, Mr. Moreno!